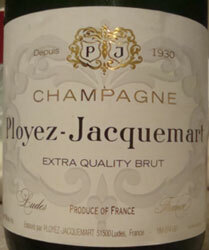 Ployez-Jacquemart was established in 1930 by husband and wife Marcel Ployez and Yvonne Jacquemart. It is run by third generation winemaker, granddaughter Laurence Ployez. They own 2.15 hectares of Premier and Grand Cru vineyards in Ludes and Mailly in the Montagne de Reims, primarily Pinot Noir and Pinot Meunier. Laurence also buys grapes from another 12 hectares of vineyards from growers with long term relationships with Ployez-Jacquemart, primarily Grand Cru Chardonnay. The grapes are all worked and harvested by hand. Grapes are sorted by variety and vineyard before pressing, and fermentation is both in vats and wooden barrels, with only a light filtration for wines fermented in vats and no filtration for those wines in wooden barrels. They use traditional yeasts, and very slow bottle fermentation due to their cold 25 meter deep cellars. In lesser years, they restrict production by selling off still wines they do not like the quality of. Disgorgement comes after up to 12 years in their cellars, and dosage is usually very minimal at 3 to 4 grams per liter. In their NV blends they use little to no reserve wines in order to preserve the vintage character, a rarity in Champagne for sure. Extra Quality Brut - A blend of 60% Black grapes (Pinot Noir and Meunier) and 40% Chardonnay, and aged 3 years. Most years no reserve wines are added. Extra Brut Rose - Only made in years when black grapes are exceptionally good, this is made by blending the Extra Quality Brut with still red Champagne wine aged in oak barrels. Extra Brut Passion - This blend is typically around 55% Pinot Noir, 5% Pinot Meunier and 40% Chardonnay, with a third of the wine matured in oak with no malolactic fermentation. 25% reserve wines are added, with 4 plus years aging in their cellars. The wines are aged with the bottles upside down, called, sur pointe, to minimize contact with yeasts while allowing additional aging before disgorgement. Extra Brut Vintage - Produced in great years. In 2003 it is 50% black grapes and 50% white grapes. Aged for a minimum of 6 years, with at least 4 of those sur pointe. Extra Brut Vintage Blanc de Blancs - Similar to the Extra Brut Vintage but 100% Chardonnay. Liesse d'Harbonville Vintage - Their top of the line wine. Always entirely produced in 225 liter oak casks, where the wines spend 6 months. This wine is always 70% Chardonnay and 30% Pinot Noir and Pinot Meunier grapes - all the others can vary from year to year. No malolactic fermentation. The nose is chalk, minerals, and orange peel. A tinge of honey, but not "honeyed." Fresh apple on the nose with air. Mainly mineral driven but with a lot more going on too. This is intense on the palate. Lots of sweet yet spicy minerals and orange peel, some well aged apple, almost but not quite apple cider. Wow. Very warm and giving. A creaminess, almost orange-creamsickle, as it breathes and warms. Where did I buy this? I need more!